A network of underground tunnels meanders through the nether-regions of Stow-on-the-Wold, snaking its way to St Edward’s Church, a site whose tree-framed entrance adds to the historic wool town’s curious aura. 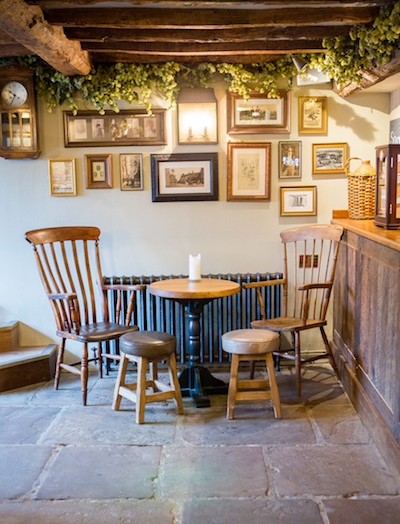 “Some of the tunnels were apparently still open through to about 20 years ago,” reveals James Rogers, general manager of The Porch House, a recently revamped local property whose deep roots apparently make it England’s oldest inn. There, in the ‘Snug,’ the historical heart of the stylish boutique B&B — complete with a comfy couch, roaring frieze-adorned fireplace and quirky country ephemera — this shared lore takes on a charmingly haunting tone. The inn almost begs for gripping tales to be told and provides the fodder: nooks and enclaves, and thoughtfully placed collectibles and accoutrements are the ‘words’ ; visitors’ imaginations provide the narrative. The Porch House seems to have fashioned its own unique sensibility: Cotswolds Cool — a reverent and whimsical nod to the Old World from an in-the-know New World perspective. Although its dining room beams were carbon-dated to 947 A.D., the latest incarnation of the ‘three-house’ 13-room property was opened, under the management of Brakspear Breweries, on 13 September 2013 (it was indeed a Friday; there are no ‘happy accidents’ here). The Porch House may well be the youngest old-timer in a tranquil town whose historical provenance is perhaps only rivalled by its undeniably antique residents (32 percent are over 65; double the national percentage). And beyond the requisite antique retailers and cookery shops, there’s even a local apparel shop called ‘Old Guys Rule’. In contrast to this, the Porch House’s staff is decidedly fresh-faced. Another segment of the population — canines — is embraced with open arms, via ‘dogs welcome’ signs in nearby tea rooms and pubs. Likewise, The Porch House’s entrances feature doggy bowls and treats. And, quite frankly, the English Setters spotted lounging den-side at the inn beside their owners, matched beautifully with the ‘hip lodge’ decor: antler chandeliers and hunter green motifs. Speaking of hunters, the framed cover of Horse & Hound from way back when, which hangs in the games parlour, is hardly an attempt to put on airs; The Porch House has, in fact, been the site of many a post-shooting party held in the adjacent tucked-away dining area. The hotel’s pub, the Eagle & Child (once its own separate house by the same name), is equally festive and bustling with local residents and visiting lovebirds popping by for a house-brewed botanical ginger beer or a signature ‘Spicy Tom’, and some laughs. The faint din of such outbursts, heard from one’s room (at reasonable hours), has its own atmospheric charm, which works well with the tasteful eccentricity of the quarters. After ascending the narrow stairs, head crouched (the ouch-worthy result of a failure to do so is on the guest, as the inn posts warning signs!) one is enveloped by its cosy confines. 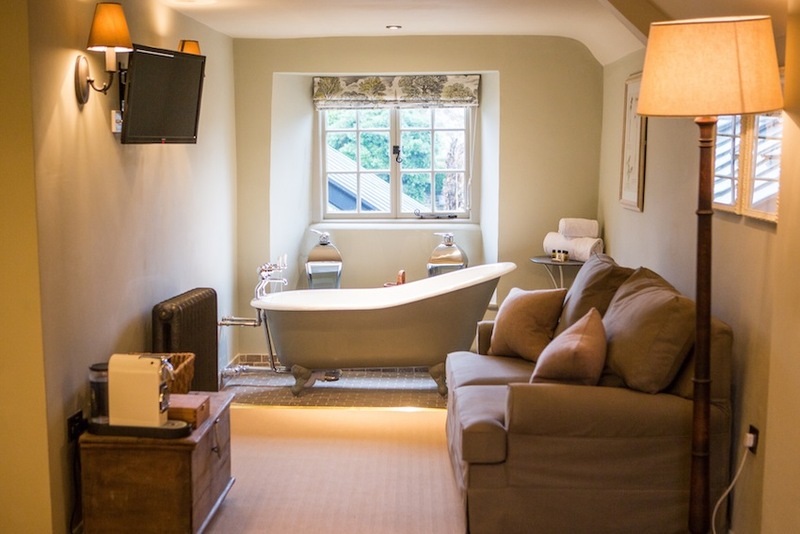 The immediately eye-catching centrepiece: a stunning in-suite claw-foot tub — a not-for-the-modest highlight of room #9 — one of the ‘feature double rooms’. Carefully curated bookshelves and side tables hold framed prints, jugs, classic tomes like The Man in the Iron Mask and Bleak House, precious tea cups, and bronze ladles. Post modern renditions of ‘quaint old things’ like a radio and telephone, are signature Cotswolds Cool, as is the adorable touch of a Fair Isle knit-clad water bottle (available for purchase). And if that doesn’t fill you with a sense of deep, warm comfort, a meal in the main dining room downstairs will. Guests can breathe easier, upon entering it: directly to the left, a large fireplace is inscribed with markings intended to ward off witches. The thoughtfully prepared gastropub fare is equally soothing: fish pie, wood pigeon, steak and the like. 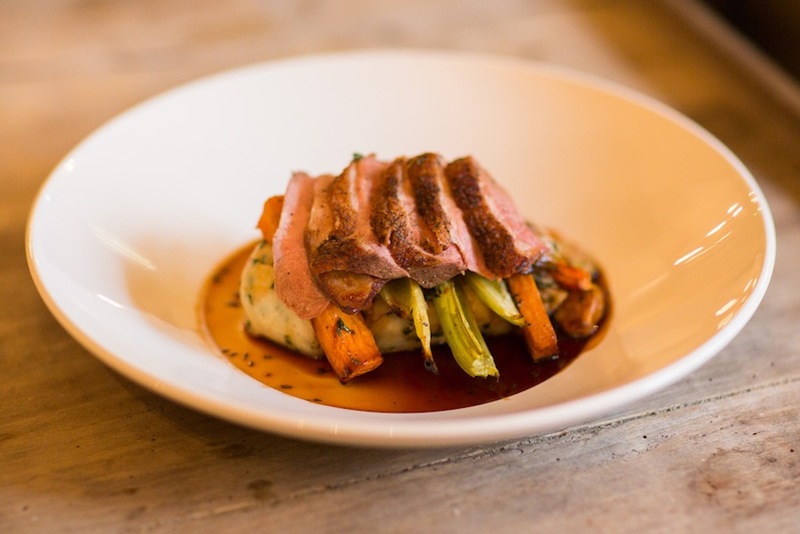 Highlights include scallops in a creamy sauce and bacon bits as a starter, a beautifully supple Creedy Carver duck breast main, and delicious gnocchi prepared casserole-style and served in a clay bowl. A brisk after-dinner walk reveals a heart-stopping quiet, and cars coated in a layer of ice with a sparkling shimmer — Stow pixie dust? Such funny little details make Stow a sleepy albeit bewitching town that promises serendipitous surprises through archways and around corners. The Porch House seems to mirror this exterior sensibility in its homely yet pristine interiors. And on a winter’s eve, there’s nothing better than discovering its intimate maze of cool cubbyholes… only to wind up right back where you started – sipping a hot toddy in the ‘Snug’. 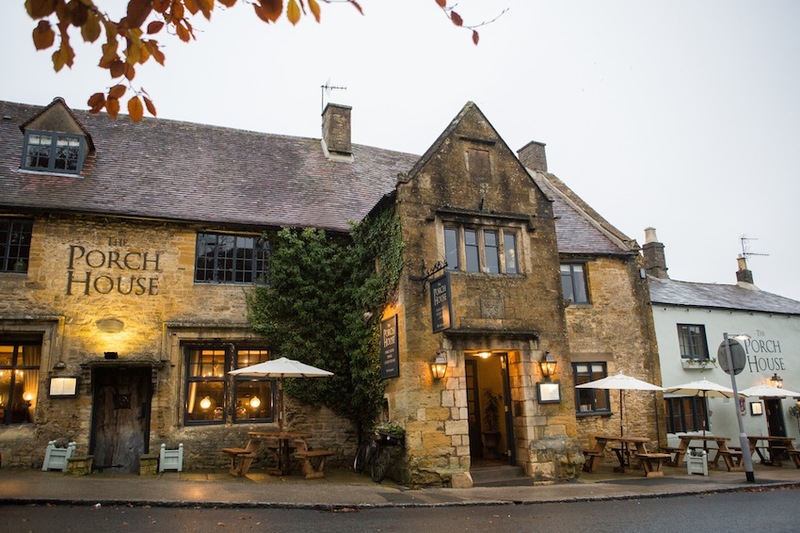 The Porch House, Digbeth Street, Stow on the Wold, GL54 1BN. 01451 870 048. For more information, visit the website. Rooms range from £99-£159 per night.